Israel is ready to negotiate with the PA but it wants to impose preconditions, says Defense Minister during a talk in Washington. The so-called “Arab peace initiative” is a spin, Defense Minister Moshe Yaalon (Likud-Yisrael Beytenu) said on Friday. 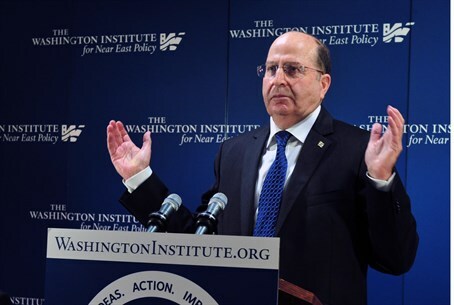 Speaking at the Washington Institute of Near East Policy, Yaalon said, "The Arab peace initiative is a spin. Prime Minister Netanyahu has said that Israel is ready to return to the negotiating table without preconditions and dictations, but the Arab initiative is a dictation - first we need to give up territory, then the Arabs would consider a relationship with us." The Arab Peace Initiative, unveiled in 2002 by Saudi Arabia, says that 22 Arab countries will normalize ties with Israel in return for an Israeli withdrawal from Judea and Samaria. It was recently revived when Qatar’s Prime Minister indicated that he supported a peace agreement between Israel and the Palestinian Authority that would be defined by the June 4, 1967 borders, but at the same time backed U.S. President Barack Obama's proposals for a "comparable and mutual agreed minor swap of the land" between Israel and the PA, to reflect the realities of the burgeoning communities on the ground. "We are ready to come immediately and talk about everything, without preconditions, but not just about territory,” Yaalon said in Washington. “The Palestinians have preconditions, and therefore the possibility to begin talks is delayed. We are ready to discuss everything with them, but without an educational change in the PA, I cannot be optimistic about progress in the process, and so we must prepare to manage the conflict." PA Chairman Mahmoud Abbas, instead of talking to Israel, has continued to impose preconditions on talks, including a demand that Israel release terrorists who were jailed before 1993, freeze construction in Judea, Samaria and eastern Jerusalem and even present a map of the future Palestinian state before any negotiations take place. In his remarks on Friday, Defense Minister Yaalon addressed the security situation in the Middle East. Regarding Syria, he said he “can’t see stability in the near future” in that country, noting that the worst-case scenario for Israel would if Al-Qaeda elements cause further destabilization in the region, particularly in Jordan. At the same time he emphasized that there are red lines that would trigger Israeli actions in Syria, including cross-border fire and the transfer of chemical and strategic weapons. He said that, while Israel was troubled by Russia providing advanced weapons for President Bashar Al-Assad’s forces, it has not seriously damaged the relationship between the two countries. Referring to Iran and its nuclear program, the Defense Minister said the West needs to show that it has the “political stomach to go all the way” if it wants to force the Islamic Republic to abandon its nuclear weapons program. Later on Friday, Yaalon is expected to meet with his American counterpart, U.S. Defense Secretary Chuck Hagel.